Let me be candid. I was shouting in the officials’ room at the swim meet on Saturday. Not my finest moment, for sure. That ugliness left me bone-weary at the end of the day. The next morning when I got up early to read, I still felt the stone in my gut, the last vestiges of that conflict. I believe that the trials in my life are ultimately God’s good for me; they are like grains of sand in an oyster that God uses to produce pearls. When I arrived at that part the other morning, I thought of the man who had shouted at me and at whom I had shouted in turn. I sat there picturing the process that happens in an oyster. The presence of the irritant is sometimes a grain of sand, but often in nature is a parasite. The oyster excretes a fluid that coats the irritant, and then coats it again and again and again. The fluid, called nacre, is otherwise known as mother-of-pearl. Shiny, luminous, iridescent. Beautiful. As I prayed, I could feel the edges of my irritation softening. I prayed it again, this time inserting a different name. I’ve been walking the edge of irritability for a while now, more and more often losing balance and falling into frustration with this person or that situation. 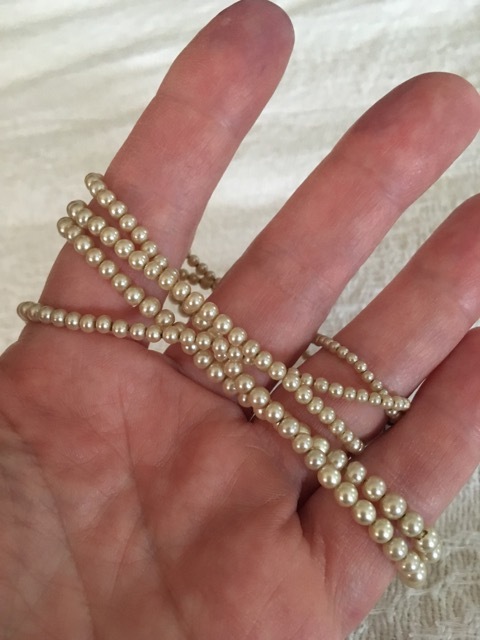 As I named specific people or issues and prayed the prayer over and over, I began to picture a string of pearls. And tears began to roll down my cheeks. The more irritations, the more pearls. I found myself feeling thankful for each one. The funny thing is, I know I have three more years of interactions with the shouting man. Three years. Just the right amount of time to form a good pearl. How I love this. Silver linings are all around us, there is always, always a meaning. Pearls are the perfect analogy. This is a perfect pearl of a post. Thank you. For my own reasons I needed that reminder today.